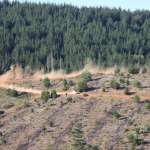 The Make Smoking History Forest Rally has been forced to make changes to its course after a serious fire occurred throughout Western Australia in February causing the loss of two stages set for the event. More than 2,200 hectares of land through the Ferndale Plantation in the Shire of Donnybrook-Balingup was burnt down, which included the areas where the Dugite and Snake Special Stages were located. Clerk of Course John Gibbons remained upbeat following the significant fire, believing the adjustments would have very little impact on the event. “It’s an upsetting thing to happen to this state and we hope that all those affected by the fires can have a speedy and positive recovery and get their lives back on track,” Gibbons said. “On our end, while it’s disappointing that some of our stages were caught up in the fires, we are working on fixing these issues and adjusting accordingly. The key changes to occur as a result of the fire is the creation of the Range Special Stage in the Ellis Plantation, the Galena Special Stage to now be run on both days and the reduction of competitive kilometres to 214km instead of the original 216km. Another significant change to occur is the event’s Service Park being moved back to the main street where it has been located in previous years. The Make Smoking History Forest Rally takes place around the forests of Nannup on 5-7 April.